Back in September, we reported that Joseph Laia's role as CEO of thin-film solar firm MiaSolé was going to be short lived (see Intel Inside, Joesph Laia Outside), and last week John Carrington assumed the role of Chief Executive Officer at MiaSolé, the third gentleman to fill that position since the firm's founding. Carrington was EVP of global marketing and business development at First Solar, and before that, at General Electric. It's a difficult situation to be dropped into, to say the least. Although the CIGS thin-film solar panel startup has made some technical and business progress, it is still bleeding cash in an absolutely pitiless market with a set of VC investors who are likely impatient for an exit. Investors in MiaSolé include Kleiner Perkins Caulfield & Byers, Firelake Capital, and VantagePoint Capital Partners. Factory capacity will be about 150 megawatts by the end of the year -- all in Silicon Valley. So the first news out from the new CEO was a plea for a partner, any partner. The CEO was quoted as saying, "A lot of companies are interested in this space, and if we could find the right partner, that could help make MiaSolé a more long-term enduring company [and] that's good for our shareholders and our employees, then I would support that strategy," according to a Reuters piece. "The strategics are actively looking at different players in the market, and I would say that MiaSolé is a company that is included in that," he added. Oh, to be a fly on the wall in the board meetings that prompted Carrington to say in the same interview: "If we don't have something, in my view, something partnered up somewhere in 2012, then I missed. For me, that would be squarely on the CEO." In other words, the VCs are not going to keep the money coming without a large industrial partner on hand. SunPower found France's Total, HelioVolt found Korea's SK Innovation, struggling Ascent Solar found an Asian white knight in TFG Radiant. There is a long list of strategics that might want a solar partner: oil companies, Samsung, Intel, or Siemens. General Electric seems to be occupied with its cadmium telluride venture in the former PrimeStar Solar. And First Solar has had its own CIGS technology development program. In any case, great companies are bought, not sold -- and it is unlikely that we will see a MiaSolé acquisition at a price that would make the VC investors proud. Not in this current market. The firm has raised in the neighborhood of $500 million in VC funding since its founding in 2004. MiaSolé raised most of a $125 million round F in February at a pre-money valuation of $550 million. New investors included Voyageur Mutual Funds III, joining existing investors Kleiner Perkins, Firelake Capital, and VantagePoint Venture Partners. Board members include KP's John Doerr, Firelake's Marty Lagod, VantagePoint's Stephan Dolezalek, and Rob Chandra of Bessemer. 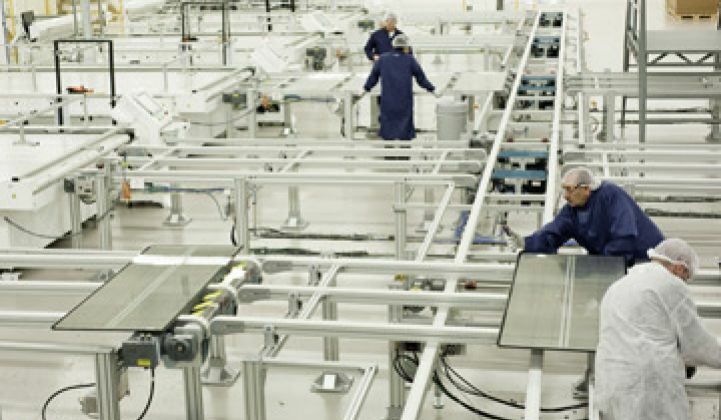 We've reported on CIGS aspirant Solar Frontier's one-gigawatt factory. Other CIGS vendors include AQT, Stion, NuvoSun, NanoSolar, SoloPower, Global Solar Energy, ISET, HelioVolt, and Ascent. As always, it comes down to price per watt and LCOE, and MiaSolé still has to prove it can compete with First Solar and Yingli on those performance metrics while making a sustainable margin as panel prices continue to drop. In the meantime, on the commercial development front, MiaSolé just announced that the U.S. Export-Import Bank financed a project in support of a small two-megawatt solar project to be built in Gujarat, India by Universal Solar System. India‘s National Solar Mission has set a target of 20,000 megawatts of grid-connected solar capacity by 2022. The Ex-Im Bank is an independent federal agency that provides a variety of financing mechanisms, including working capital guarantees, export-credit insurance and financing to help foreign buyers purchase U.S. goods and services.